The Couch's spadefoot toad (Scaphiopus couchii) is a chubby desert toad native to the southwestern United States and parts of Mexico. 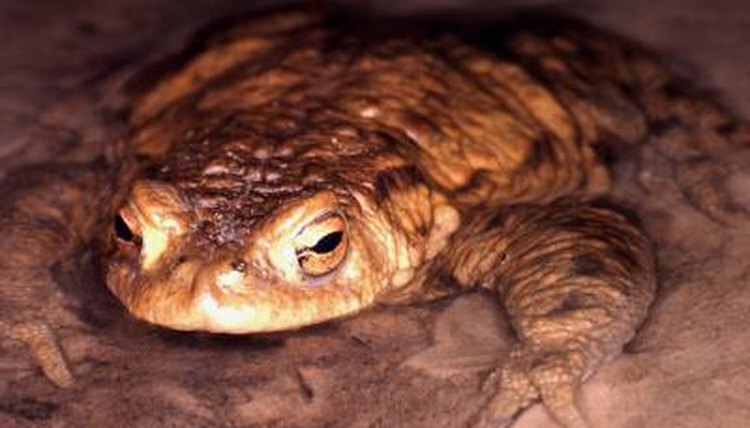 The species can be cared for in many of the same ways as other pet toads. With an appropriately sized terrarium, proper heat and adequate moisture levels, you can keep a spadefoot comfortable. Start with a terrarium at least 2 feet wide by 3 feet long and 2 feet tall. You can use a glass aquarium with a mesh lid or even a clear plastic storage container. If using a storage container, choose one with a locking lid and drill small holes into the lid and container for ventilation. Fill the terrarium with several inches of substrate. Spadefoots like to dig into the ground, so make sure the substrate is deep enough that your toad can burrow and completely cover himself. These toads grow from 2 to 3 1/2 inches long, so a 1- to 2-inch layer of aquarium-safe gravel topped with at least 4 inches of sandy soil should provide enough burrowing room. Make sure to use potting soil free of fertilizers and pesticides. Provide a heat source for your toad if your climate requires it. Spadefoots are native to the desert and tolerate temperatures between 70 and 85 degrees F. Make sure the heat source favors one side of the terrarium so your toad can escape to one end or the other and adjust his body temperature. Heating pads or lamps designed for reptiles will provide adequate heat for this desert amphibian. Add rocks, logs and other toad-safe decorations to your terrarium. This will provide your toad with places to hide during the day and hang out during his active period at night. Provide your spadefoot with a dish of clean, dechlorinated water. These toads live in dry regions but definitely need water to survive. Choose a heavy water dish that won't tip easily to help keep the water clean. Feed your spadefoot live insects whenever possible. In the wild, spadefoots eat grasshoppers, termites, ants, katydids, beetles, spiders and other invertebrates. Your pet spadefoot will do well on a diet of crickets, mealworms and any other bugs you can buy at your local pet store. Store-bought toad pellets can also make up part of his diet. Toads will eat as much as you give them but luckily aren't prone to gaining weight, so how much you feed your spadefoot is at your discretion. Complete your spadefoot's diet with a nutritional supplement. Pet stores sell supplement powders specially designed for amphibians that you can sprinkle on your toad's store-bought food. Clean up after your toad. Spadefoots can go several months without eating in the wild, but if they're eating regularly in your terrarium they will also produce waste regularly. Remove and clean any soiled tank decorations with antibacterial soap. Rinse and dry items thoroughly before returning to the terrarium to ensure no soap residue remains. Keep the lights off if your toad is active. Spadefoots are nocturnal and normally only come out of their burrows between dusk and dawn. If you want to observe your toad during his active time, use a very dim, indirect light source so he won't be disturbed.  Use a combination thermometer/hydrometer to monitor the moisture and temperature in your terrarium. These devices are reasonably cheap and available at most pet stores.  You can eliminate chlorine from tap water by leaving it open to air for 24 hours before placing it in the terrarium. ⚠ Couch's spadefoot toads produce a skin secretion to ward off predators that can cause allergic reactions in people. Handling these animals can cause watery eyes, swollen eyes, sneezing and itchy skin, especially in broken skin. Always wash your hands immediately after handling a spadefoot.